Walker’s ties to Fort Worth’s legal, business, governmental, and philanthropic communities are lifelong and extensive. 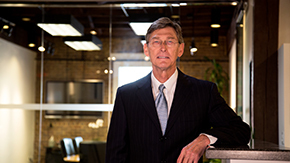 With that background, Walker brings a unique perspective to all forms of commercial, business, and oil and gas litigation, as well as trust and estate disputes, throughout the state. And as former chair of the Texas bar’s largest division—the Litigation Section, with over 7,500 members statewide—Walker has had the opportunity to shape some of the issues important to Texas’s litigation community as a whole. A frequent CLE-seminar speaker, he has also been institute director of several State Bar litigation seminars. Attention to detail and thorough preparation have been twin hallmarks of Walker’s practice from its big-firm beginnings to the founding of FSC in 1993 and through today. Clients and referring lawyers can be confident that all possible angles will be anticipated and thought through, before and during every stage of the litigation process. Walker has been accorded the highest Peer Review Rating™ by Martindale-Hubbell®: AV Preeminent®, and in the fall of 2014 was named a Fellow of the American Bar Foundation.